(PRLEAP.COM) San Diego, CA Jan 19, 2019 - DO-178C Training and ARP 4754A/4761 Training locations and dates in 2019 added by ConsuNova to meet surging demand. Expanded training schedule in response to market demand for practical instruction and focused topics such as "Optimized path to DO-178C Compliance" – ConsuNova adds locations and dates for the United States and Europe. "Practical", "engaging", and "applicable to our organization" are the most common comments gathered in hundreds of feedbacks from attendees of ConsuNova's avionics training courses. 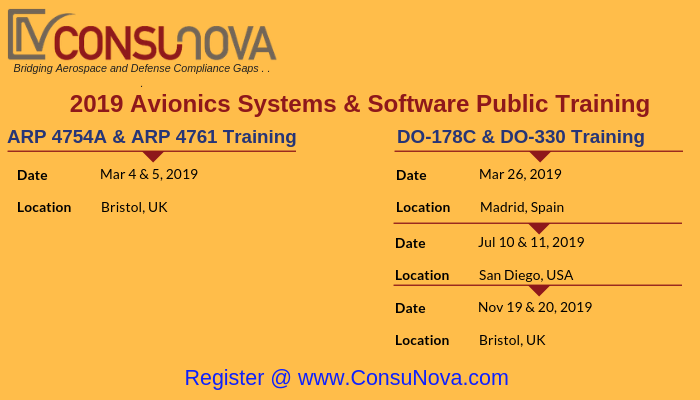 ConsuNova, Inc. has seen overwhelming response to its updated DO-178C training course offer and supporting white paper series such as "Optimized path to DO-178C Compliance." To meet surging market demand, additional public ARP 4754A/4761 courses have been added to the 2019 training calendar. As compliance and certification experts, ConsuNova, Inc. works on both commercial and defense projects around the world. That experience keeps us at the forefront of technology and regulatory trends, along with industry best practices for integrating the two into modern avionics and aerospace projects. Our courses are not "just another basic training" sessions: they are given by seasoned working experts in avionics domain and provide a practical, focused approach to understanding, implementing and successfully executing compliant plans, processes and required support data. Andrea Sanchez, European Business Development Manager, adds: "We constantly get requests for advanced trainings. You can't learn avionics standards "by the book", you need practical advice and experience from experts working on real projects. This is precisely what we offer, unlike other training companies in the market, and this is why people keep chossing ConsuNova for their training needs".